We never cook our sweet soups w/o it, never boil our sugar syrups w/o it. Life is just bland w/o it. Pandan or Screwpine is a common colouring and flavouring plant used in South East Asia (I'm not sure abt other parts of the world). It's one of the most common "herb" that u can find in our gardens or pots. During the olden days, before the birth of blenders or liquidizers, these leaves are pounded with the mortar and pestle to obtain the precious green extract. Now, what the heck for all the trouble and arm work???? Just use the blender! But before that, u have to snip the leaves as thin as u can with scissors, no knifes, can't do the work like scissors do. Why snip it? Why can't I just break them up and throw them in. Yeah, u'll work ur blender blades til they drop. Pandan is very fibrous, the long fibres are no easy task to break up, even with a micro cutter blender that I have. Wash it before u snip it, no need to dry it. Discard the torny tip and white bases. The torny tip will itch ur hands when u squeeze the juices and the white base is slightly bitter. Use mature leaves(but not old leaves) , not shoots as the shoots can be slightly bitter and contain less pigment. But do not discard the shoots, u can still use them to boil sweet soups, it doesn't taste bitter this way. 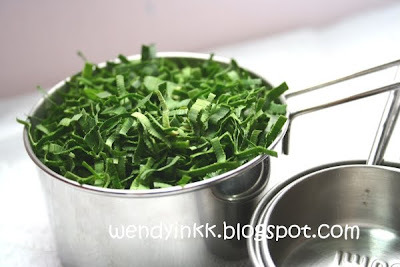 In the pic I used 1 cup of snipped pandan leaves, abt 25gms. Then u put them into a blender with 1 cup of water, and whizz away. Put the cap on!!!!! Pour blitzed pandan over a fine strainer, and SQUEEEEEEEZZZZZZEEE!! Repeat the blending process and squeeze again! Do this until u can no longer obtain a beautiful green colour. See the difference in colour?? 1st round : Good for cakes and anything that needs really concentrated juice. If making chiffon cakes.. this is it! 2nd round: Good for seri muka, jelly or pau/mantou, where the pandan extract is mixed with other liquids for use. Ondeh-ondeh/buah melaka will be ok using this one too. 3rd round: Good for cendol, kuih talam where a lot of water can be used. To make it really concentrated, like for my pandan butter cake, leave the juices(all if u want) in the fridge for a few days. They won't go bad. And the chlorophyll will sink...................... to the bottom. Seeeeee!! Pour away the upper layer of water, leaving behind moss like powder... U have it, concentrated pandan extract. Well the glass of pandan juice in this pic was left in the fridge for almost 5 days... it took so long this time. usually by 3 days it'll sink. So better do this in advance so that u'll have really green pandan. The upper layer need not be thrown away, as there is fragrance there, just mix it with other rounds of extracts to make stuff that require more dilute pandan juice. Keeps well in the fridge for up to 2 weeks. Discard when it smells like rotten leaves. Do not freeze it. I've tried it, the fragrance is lost and the chlorophyll gets separated from the water. Updated: 17/12/09 : This time I got the concentrated layer in just 18 hours. I used the sunken part to make Oiless Pandan Chiffon and whatever balance for Pandan Mantous. Wow didn't know have to take few days to get the concentrated pandan extract.The screwpine in canada don't have any pandan fragrance :( too bad I have to use the pandan essence for most of my dessert.Didn't know the pointy tip can itch our hands.nice tip! I make my own pandan juice too but I didn't weigh the leaves. Also, I used only 100+ml water to blend with the leaves. My 1st, 2nd and 3rd (maybe even 4th and 5th) rounds went into 1 recipe. And I thought mine's not as green as yours. Maybe I should snip them shorter? Do check out my pics here. I used more than 20 pandan leaves(1ft long), I can't remember how many, but definately more than 20. Older leaves give better colour, but tough on the blender. I saw that post b4.. and that's a great idea too. ICIC..... next time dun use the baby leaves, bitter leh. Thanks for this interesting and useful information. Now I just have to figure out how to get pandan juice without a blender or mortar. Maybe with a grinding stone? 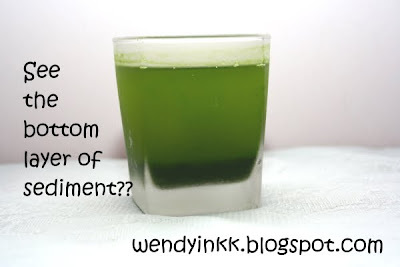 Thanks for sharing tips on how to get concentrated pandan juice. 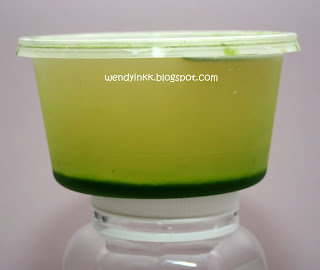 A question on subsequent rounds of pandan juice, how much water should be added, is it 1 cup (240ml)? i.e. 25g finely shredded pandan leaves + 1 cup water then blend and squeeze to get 1st round; for 2nd round add 1 cup of water to the remains, then blend and squeeze; for 3rd round, add 1 cup of water to remains, then blend and squeeze, etc. The amount of shredded leaves is up to you. If you happen to have more, the put in more, have less the use less. Sometimes pandan grown is different areas will yield different levels of fragrance and colour. So, this is just a guide, the amount is not fixed. Thanks for sharing this information. We have a lot of pandan here in our garden and I only knew it as a good addition when cooking rice. You can use the extract to make desserts and cakes. I hope you'll find more uses with this wonderful plant. Dear Wendy, Very grateful for your recipe. Have been searching for this for a long time! Took with me a large bundle of pandan leaves from my mom's garden in Singapore. I live in Holland. Time to re-create the frangrance of the Orient in the Occident. Thank you Kitchen Queen! LOL, the title's too grand for me. May I suggest you try blending the leaves with oil(if you can't finish it before it wilts) and strain the oil. I saw one blogger doing that, and it may keep the precious extract longer. I advise you not to freeze the extract as freezing causes it to lose it fragrance. Thanks for sharing...like your blog so much. I am from Singapore and was thinking what to do with the pandan plant growing in my garden. It has grown very big and tall and is impossible to use all for my kaya and sweet desserts. Making Pandan Extract is a great idea, but a storage life of 2 weeks is quite short. I am wondering if there is any way to prolong its storage life without adding additives or preservatives haha.. Thanks for the share. Love it! Pandan juice cannot be frozen, unfortunately. The fragrance will be lost. Make lots of things with it. You can read up all the pandan posts here and make jelly, cake, roast chicken with it, grill fish with it, or the longest preserving method is to make pandan kaya. Making kuih tako is another method to quickly use up the leaves. I just used one big bunch the other day to do this. Can pandan leave be frozen? Only frozen pandan leaves is available here. I find they are less fragrant than fresh leaves in Malaysia. When frozen, the fragrance is lost. It can survive, provided you bring them in for winter and plasce them near the windows for light. A blogger friend who lives in Pensylvania told me so. Same goes to western herbs here. Rosemary grows by the bushes there but cost 2 bucks for few sprigs here. Sweet Basil is almost 5bucks. damn i wish i did this before i left singapore. then i can have pandan extract to use for the nest 2 weeks in london at least... great tip? is there any way you can make pandan extract last even longer? like some pple steep vanilla beans in alcohol to make vanilla essence.. hmm a pandan essence maybe? haha. How u read my mind! I've been thinking of tht too. But I'm thinking, do we need to dry the leaves first. Don't want the moisture from the leaves to thin down the alcohol, hence reducing its power to dissolve essential oils. Hi wendy, which part is called torny tips and shoot? Hehe... I tak pandai all this..I snipped before but all koyak one. 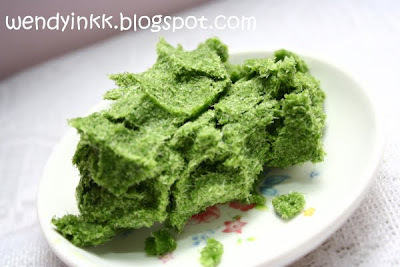 This time I want to try to make ondeh ondeh but dont know how to make pandan juice. the tip la.... hujung daun. Got thorns one, u see carefully. shoots is the baby leaves. koyak mai koyak la, still going to blend it anyway, LOL. If you buy those loose leaves then won't have. But if your pandan bunch comes like a bush (it's totally cut off from the top like a bunch of vege) then you will have baby leaves. Yeah 3rd round good for onde-onde, or even kuih talam. But if your onde onde has sweet potato,then 1st round will be better. Tq Wendy..just finished blend the juice..
Oooooh! Thanks so much for the lovely instructions and explanations! I was looking for something like this for a while as I looooove the flavor and want to try and bake my first pandan chiffon cake today. I contemplated doing this with a huge bunch of pandan leaves that I have to finish up. Ended up making pandan-infused sugars instead, but linked to your blog post anyway from my blog! really good experiments (: you're so thorough! 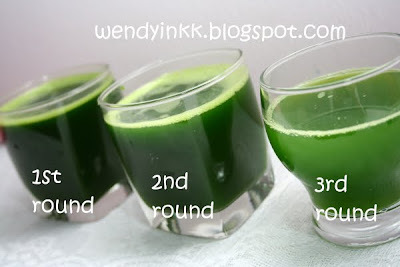 Hi Wendy, I tried to make pandan bread with this pandan juice. But the bread turned out no pandan smell and no green color at all. I have used about 50-60 pandan leaves for the juice. Can you advise on this? Thanks. 50 leaves and no smell at all? Hmmm....I think you better pluck your leaves elsewhere, the pandan plant not quite 'right'. But then again... 50 woh.... are they the 6 inch long 1/2 inch wide type? The mini ones? Chanced upon your recipe and tried making some pandan juice! Not sure if the amount i'm using is not right or I'm doing something wrong. Instead of a pandan smell/aroma in pandan essence/paste, my end product smells very green! Like a veggie juice! Not sure if that is normal?! And whether the mixture can (or should) be used. First of all natural pandan is a leaf, it does smell green. Bottled essence or flavouring is not natural, and does not come from a leaf, and what you smell is what you get after baking, it actually carries a touch of coconut flavouring as well. Natural pandan when used in bakes together with coconut milk or coconut oil, will only exude that wonderful aroma when it is baked. When used without coconut milk, it actually gives out a fragrance which is subtle and delightful. Just like all veggies and leaves , they don't taste the same raw and cooked. So glad to come across your blog. I blended some pandan leaves yesterday and left the pulp in its water overnight. I strained it this morning, put it in a jar and stored it in the freezer as I planned to use it in 5 days time (thinking it would be gone in the next couple of days if i leave it in the fridge). As soon as i read your post I quickly took it out from freezer (thankfully it's still in liquid form!). Glad to learn something new today. Thanks for the tips! the bitterness is due to the leaf itself. From my experience, the bitterness usually comes from young leaves.